The other day I was playing a podcast on an iPod and had to stop listening for a while. When I resumed play some time later, the damned thing started again from the beginning. I had to search through to find where I had been up to, always an uncertain enterprise. Now these were Econtalk podcasts and while I really ought to just get them in from iTunes, for historical reasons I have downloaded them as regular MP3 files and dropped them into the normal ‘Music’ section on the iPod. Since they are not tagged as podcasts, the property ‘Remember playback position’ is not checked by default. So I go in as I download them and click this on. We’re talking about fairly intellectually intense discussions here of an average one hour in length, so being able to pop into and out of them at will is something to be valued. Anyway, it appeared that I’d stuffed something up and a spot check revealed that at least some of them didn’t have the ‘Remember’ property ticked. I could have gone through one by one and checked. I could have (I belatedly realised) checked this property for the files on the iPod. But I didn’t. Almost without thinking, I simply deleted the 34 podcasts from the iPod, checked the property in iTunes, and dragged and dropped them all back to the iPod. A little over a minute later the problem was fixed. Which brings me to the point of this post. 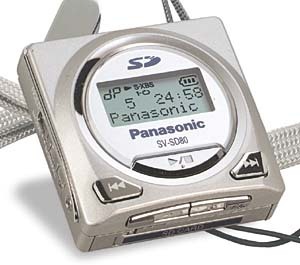 Those podcasts were 64kbps MP3 files. So halving their run time for the purposes of comparison to 128kbps music content, they came to 1155 minutes (somewhat more than 19 hours). The transfer time was a touch over one and a quarter minutes. That comes to about 0.11% of the playing time of 128kbps content, a measure I’ve been using for years. I have no doubt that my computer and setup isn’t optimal for the fastest possible transfer. Nonetheless, this shows how things have improved. This works fast: a 128kb/s MP3 track takes just 7.6% of its playtime to download. That was not so unreasonable, I suppose, in the context of what now seems to be a tiny 64MB SD card, which was what was supplied for storage. But, wow, 7.6%! Around the same time I did the Creative Nomad Jukebox. It was faster at 4.0%. And the Apple iPod? I did a first gen one. Apple loaned a Mac to me since the first gen iPods weren’t Windows compatible. It did the transfer at a lightening fast 0.34%, over Firewire. Incidentally, the RRP of the iPod was then $895, in dollars that were worth rather more than today’s are. 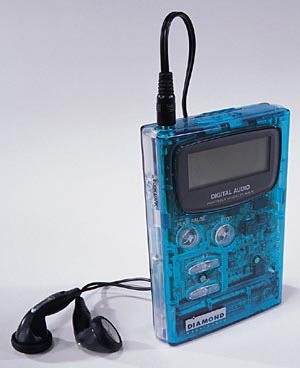 But let’s press back even a little further, to the first two MP3 players I ever reviewed. The date: October 1999. 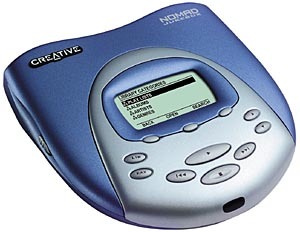 The contenders: two CD players that also supported MP3 files on CD-ROM, two MiniDisc recorders, and two portable MP3 players. One of these was the Diamond Rio 500. USB transfers proceeded at a sprightly 3.3%, despite it being still back in USB 1.1 days. Impressive! The other was the Grundig Mpaxx player. This poor thing was burdened by the use of a serial port (RS-232C) for transferring music to it. Oh. My. Goodness. It’s transfer time was an incredible 180%. Yes, it took longer than the playing time of a 128kbps track to shift it from a computer to the player. Haven’t things gotten a great deal better? This entry was posted in Computer, Portable. Bookmark the permalink. Wonder how much they’re worth these days… :p Probably nothing :(.